Minutes after Secretary of State Mike Pompeo landed in Pyongyang, while he was still on the runway, his North Korean counterpart immediately began dictating the terms of his meeting with Kim Jong Un. Pompeo's plane had not yet shut down its engines. Pompeo was told he could not bring his translator or his armed bodyguard into the meeting with the North Korean dictator. Pompeo responded quickly with a tight smile. "Okay, I hope that she can be there," Pompeo said, in reference to his translator. "We will figure it out and make it work." Pompeo, on his fourth trip to the country after negotiations had stalled since his last trip, didn't raise a strong objection. He also, in essence ignored the directions about leaving his security detail behind when he met with Kim. The demands came from Kim Yong Chol, who has been Pompeo's primary counterpart in these negotiations. He is the country's former cyber chief, and he is notoriously challenging to deal with in U.S. interactions. "Big guy," Pompeo said of his bodyguard. Diffusing the tension in the air, he laughed and puffed up his shoulders, in an effort to imitate the broad physicality of his Diplomatic Security Service detail. Pompeo's motorcade then headed for the regime's Peakhwawon guest house. On the 20-minute drive, fewer than five other cars passed the motorcade on the roads. It was a Sunday morning, but the surroundings still felt eerily quiet. A few men in dark suits walked along the sides of the road, in between us and farmland. Their arms swung back and forth, as if they were on a mission, but that mission was not evident. Women in matching sweatshirts coasted by on bikes. Empty baskets were fastened to their bicycles. The city of Pyongyang was far off on the horizon as we were driven to an idyllic setting, nestled into a woodland alcove a little less than a mile after we passed a monument laden with large photos of Kim Jong Un's father and grandfather, the Kumsusan Palace of the Sun. Later that morning, Pompeo's motorcade queued up to head from the guest house to his meeting with Kim. If Pompeo thought he had succeeded in getting his translator into the meeting during that the runway conversation, he was about to be proven wrong. Pompeo hopped in a black stretch Mercedes, alongside U.S. Special Representative to North Korea Steve Biegun. Andy Kim, the director of the CIA's Korea Mission Center, and the U.S. translator entered the car behind him. Then, the U.S. delegation's movements stalled. The cars sat in the driveway for five long minutes as the North Koreans scurried around the driveway, whispering to one another. Pompeo's security detail cast nervous glances at one another. Eventually, Pompeo's car door opened for an brief inaudible discussion between Pompeo and North Korean officials. The U.S. translator was taken out of the car behind Pompeo. Finally, the motorcade rolled away. Pompeo headed into his meeting Kim Jong Un with his Diplomatic Security Service detail intact, but without his translator. Heather Nauert, the State Department spokesperson on the trip, noted that Andy Kim, who is fluent in Korean, was alongside Pompeo when he met with Kim Jong Un to secure the release of three Americans earlier this year, which Nauert said was not uncommon. Pompeo may have gone into the room without his official photographer because he didn't want to jeopardize his meeting with Kim. The last time Pompeo visited the country Kim stood him up. This time, their meeting lasted about two hours. This was progress, in terms of U.S.-North Korea communications. An administration official on the trip admitted that this go-round was "better than the last time." But the same U.S. official said that still, "its going to be a long haul." That sentiment especially rang true on Sunday in Pyongyang, as North Koreans still had some surprises for the highest-ranking U.S. diplomat. After their meeting, Kim Jong Un decided to join Pompeo for lunch, which came as a surprise to both the U.S. delegation and the North Koreans. It meant that Pompeo and Kim Jong Un would spend an unprecedented three-and-a-half hours together. Over lunch, I asked a North Korean official whether the Kim-Pompeo lunch had been expected. "Definitely not," was the reply. 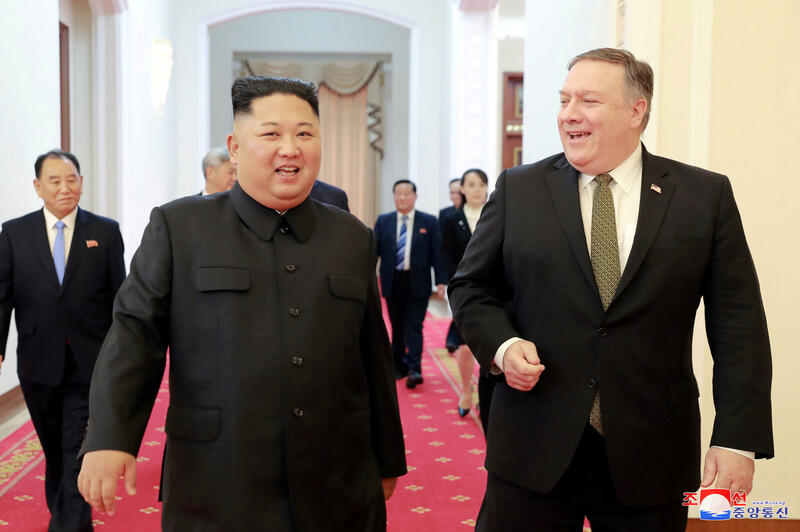 Pompeo and his team meandered around the hallways of the Pyongyang Peakhwawon guest house, and waited for Kim to arrive for lunch. Andy Kim, crossing his arms in front of him, seemed comfortable with the North Koreans, leaning in close to hear what his counterparts had to say, and shook his head downwards to laugh frequently. Pompeo, too, seemed loose, giving one North Korean official a lighthearted slap on the back, similar to the affectionate tap he gives to U.S. government officials when he leaves a country. The guest house, extravagantly decorated, is situated in a picturesque woods-like area. Its walls are covered in grandiose landscape paintings with gold frames, and its floors are lined with thick red rugs. Newspaper stands display glossy magazines depicting places like North Korea's "Munsu Water Park," where North Koreans are photographed cheerfully playing in matching bathing suits and jogging on treadmills in bare feet. A newspaper on the top of one stands was dated September 29, more than a week before our visit, and the front page had a story on iron and coal. None of the stories were about the U.S.
Pompeo was moved to the front door, where he stood to welcome Kim Jong Un. Pompeo clasped his hands in front of his body, waiting patiently, with a flat expression on his face. "It's like you are standing at the altar," Nauert observed. Pompeo turned around to acknowledge her comment. He smiled but didn't reply. The comment reflected the power dynamic of the moment, that the North Koreans held all of the control during the visit. Now Pompeo was standing, waiting expectantly, with no idea when Kim might materialize. "It's good to see you again," Pompeo said when Kim Jong Un finally came through the mahogany doors, his wide black pants swinging back and forth. They held eye contact briefly and smiled, aware of the cameras trained on them. "So is everything OK?" Kim asked Pompeo, leading him down the hallway towards their lunch. Because this was Pompeo's fourth visit to Pyongyang, Kim Jong Un asked whether he felt things were more familiar now and suggested that he must not be feeling the "first strange feelings" that he had when he initially came to the country. Pompeo agreed. As they took their seats, Kim Jong Un gleefully pointed at the cameras in the room. Two of them — mine and the official U.S. photographer — were the same cameras that he would not allow into his previous meeting with Pompeo. The secretary of state told Kim that the cameras were for him. Kim Jong Un chuckled. The U.S. translator also took a seat next to Pompeo, the same translator that Kim Jong Un would not allow into the previous meeting. "As I said before, it's a very nice day that promises a good future," Kim Jong Un said to Pompeo, "for both countries." "We had a great, great visit this morning. Thank you for hosting. President Trump sends his, his regards," Pompeo told Kim. "And we had a very successful morning so thank you and I am looking forward to our time here at lunch as well." The U.S. cameras were taken out of the room. The North Korean cameras stayed inside. Pompeo dined with Andy Kim, Steve Biegun and his translator while the rest of the U.S. delegation, a handful of Diplomatic Security Service special agents and North Koreans ate a similarly large and elaborate meal. The menu included foie gras, boiling hot conch soup -- served in a conch shell -- steak, grilled pine mushrooms and chocolate cake. North Korean official Kim Song Hye gave a toast to the women at the table. Pak Chol then to the men and to US-NK relations. "To family and good relationship," said Pak Chol, the vice chairman of the Korean Asia-Pacific Peace Committee said, in reference to U.S. and North Korean relations. I sat between two North Korean officials and asked them about the next Trump-Kim summit. They said it would be great to have it in Pyongyang. They asked me about whether Mr. Trump's party would win the midterm elections and about dating in the U.S. When I asked about the "gangster" characterization of Pompeo after his last visit, a North Korean official said the ongoing sanctions had inspired those remarks. One official, through a translator, described Trump as "generous" and "a leader." Kim Song Hye asserted that the two countries "wouldn't be here without Trump." After about an hour and a half, Kim Jong Un left before we had time to catch him departing. Before departing the guest house I asked Pompeo whether any progress had been made. Nauert, standing next to us, interjected that he wanted to give a readout to "the boss" first. "You are trying really hard," Pompeo said to me. There was nothing in his body language to suggest how the meeting had gone either. Then, Pompeo was instructed to wait a little longer before going to the airport. Kim Jong Un's sister came rushing over with a white envelope, with a thumb drive of photos documenting Pompeo's visit with Kim Jong Un. It was the meeting that the official U.S. photographer and I were barred from entering. So, after about six hours on the ground, Pompeo boarded his plane. A group of North Korean construction workers watched the U.S. aircraft prepare to take off. The most modern tool they held was a shovel. There were no machines in sight. As the plane taxied, fleet of motorcycles could be seen sitting alongside some farmland in the distance. When the plane tipped into the sky, as if on cue, the motorcycles sped off in different directions. They made the land appear a little bit more busy than it had looked when we arrived. When Pompeo landed in Seoul, while the U.S. team was working on a statement about the trip, Mr. Trump tweeted about the meeting. "@SecPompeo had a good meeting with Chairman Kim today in Pyongyang," he wrote. "Progress made on Singapore Summit Agreements! I look forward to seeing Chairman Kim again, in the near future." The photos in Mr. Trump's tweet had been taken by the North Koreans. Editor's note: An earlier version of this story misidentified Secretary of State Mike Pompeo's security detail as Secret Service, rather than as Diplomatic Security Service.